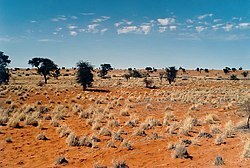 The Kalahari Desert is a large arid to semi-arid sandy area in southern Kgalagadi Africa extending 900,000 km² (362,500 sq. mi. ), covering much of Botswana and parts of Namibia and South Africa. It has huge tracts of excellent grazing after good rains. The Kalahari Desert is the southern part of Africa, and the geography is a portion of desert and a plateau. The Kalahari supports some animals and plants because most of it is not a true desert. There are small amounts of rainfall and the summer temperature is very high. The driest areas usually receive 110–200 millimetres (4.3–7.9 in) of rain per year, and the wettest just a little over 500 millimetres (20 in). The surrounding Kalahari Basin covers over 2.5 million km² extending farther into Botswana, Namibia and South Africa, and encroaching into parts of Angola, Zambia and Zimbabwe. The only permanent river, the Okavango, flows into a delta in the northwest, forming marshes that are rich in wildlife. Ancient dry riverbeds—called omuramba—traverse the Central Northern reaches of the Kalahari and provide standing pools of water during the rainy season. Previously havens for wild animals from elephant to giraffe, and for predators such as lion and cheetah, the riverbeds are now mostly grazing spots, though leopard or cheetah can still be found. The Kalahari has a number of game reserves—the Central Kalahari Game Reserve (CKGR, the world's second largest protected area), Khutse Game Reserve and the Kgalagadi Transfrontier Park. Animals that live in the region include brown hyenas, lions, meerkats, giraffe, warthogs, jackals and several species of antelope (including the eland, gemsbok, springbok, hartebeest, steenbok, kudu, and duiker), and many species of bird and reptiles. Vegetation in the Kalahari consists mainly of grasses and acacias but there are over 400 identified plant species present (including the wild watermelon or Tsamma melon). The Bushmen of the Kalahari were hunter/gatherers. They hunted for meat and gathered the food of the desert to eat. They did not keep animals. They moved from place to place to find food and water. They owned very few things because they had to carry everything themselves. Very few people still live this way anywhere in the world. ↑ History and Geography. LIFEPAC. Alpha Omega Publications. p. 23. ISBN 978-1-58095-155-5. Wikimedia Commons has media related to Kalahari.